On Saturday, Michael Dunn was convicted of three counts of second-degree murder while the jury was torn on the killing of unarmed black teen Jordan Russell Davis, 17. It happened. It was sad, wrong, and terrible and it happened. Most of us expected some type of injustice to ensue. But, I’m sure none of us could have imagined that Dunn would be convicted for not killing enough young boys that day. This is my first time writing about the trial because…well, because I got too invested in the George Zimmerman trial last year. It became a personal issue for me. It hurt me so deeply. So now, I have taken to emotional detachment as a coping mechanism. I took to Twitter to read words from acquiescent black murder apologists like “grateful,” “at least,” and “partial justice.” Some folks were happy that Dunn would be going to prison for “attempting” to kill Jordan Davis’ three other friends who were in the car with him that day. They felt at least partially satisfied that, unlike George Zimmerman, Michael Dunn wouldn’t be walking away free. What they didn’t realize was that the conviction – no matter Dunn’s age and likelihood of rotting in a prison cell – was not justice for Davis.These folks don’t have the courage to admit that their Kool-aid has gone sour. There just aren’t enough straws to grasp anymore. In essence, Dunn could have shot and killed Davis, walked down the road, then shot at – and missed – all of Davis’ friends and the same outcome would apply. Dunn didn’t kill enough young boys playing “thug” music to walk free. Only in America can a grown man – with obvious racial hatred – shoot and kill a young black boy only to go to prison for shooting at the boys he didn’t kill. Had those boys not been in the car with Davis, Dunn wouldn’t be serving any time at all. Let that marinate with you for a bit. 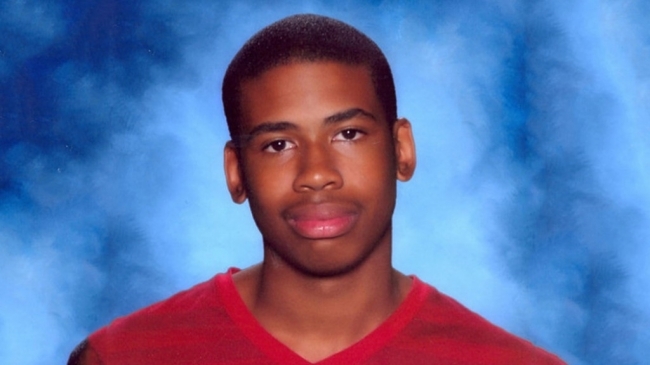 I saw media outlets trivialize the murder of Jordan Davis as a ‘loud music‘ case. Minimizing the obvious racial venom pulsing in Dunn’s white body works for reads and traffic but it ignores the truth. They don’t have the courage to call this hate crime and the subsequent miscarriage of justice by their first names. This is a country where we promise “life, liberty, and the pursuit of happiness.” We do that because we are all buying into the Grand Lie. We want to believe it so badly that we’ll just assimilate with dominant white culture which tells us that we are the problem. We’ll nod our heads in agreement when we are told that “black on black” crime is more of an issue than the hapless murder of our black boys by white gunmen. We’ll say things like, “Oh, well Oscar Grant was acting like a punk,” or “Trayvon shouldn’t have fought back,” or “Jordan should have just turned his music down.” We’ll pretend like any actions on their parts would have prevented their demise though we know statistics don’t support those claims. We’ll feign ignorance at the fact that systemic racial hatred jettisoned bullets through those black bodies. We’ll wear the mask of W.E.B. Du Bois’ famed twoness. I won’t play along but all the rest of us will. And, frankly, I’m sick of it. I abstained from dialogue on the killing of Jordan Davis by Michael Dunn because of the very tension I am feeling right now. The pain is palpable. I am raising two young black boys. And, like Grant, Martin, and Davis, I know that the system will never adjudicate in their favor. I know that. I know that their brown skin will always be threatening. I know that. I know that they will receive messages from the mainstream that they don’t belong or that – if they are smart and talented – they are an exception. I know all that. Soon they will too. I have the courage to raise my boys in a country that hates them. But, I won’t drink the Kool-aid. I won’t retell the lie. I have no further use for the fable. February 4, 2013 Young Girl Who Performed at Inauguration Shot and Killed in Chicago, Kiese Laymon’s Narrative Again?